Dr. Huey Emmerich is the scientists to the team of Diamond Dogs and close confidant of Big Boss. He was also responsible for the development of bipedal locomotion technology of the Metal Gear during the events in Metal Gear Solid: Peace Walker. In MGS 5: The Phantom Pain he is back on the field again. Huey Emmerich is the father of Hal "Otacon" Emmerich and sees this confusingly similar. He learned Big Boss during the "Peace Walker" incident 1974 know in Costa Rica and has since been a member of MSF and now he is in MGS 5: The Phantom Pain for Science Team of Diamond Dogs. MGS 5 - The Phantom Pain: Who's Huey Emmerich? Dr. Emmerich was born on August 6, 1945 the day of the atomic bomb attack on Hiroshima. Ironically, his father belonged to the science team that was involved in the Manhattan Project to develop the atomic bomb. Huey is to walk on incompetent due to paraplegia from birth. Because of an abnormal deformation of his spine he is bound to a wheelchair. He has since been back and forth between admiration and aversion due to the deed of his father. After he graduated at MIT, Huey joined NASA and worked there together with Dr. Strangelove together, "Huey". Emmerich was a colleague of the Soviet scientist Aleksandr Leonovitch Granin, whom he helped in the development of bipedal tanks in the 60s. In 1974, he introduced himself then in the service of the CIA, led by Hot Coldman, which he was to help with his research results to develop the perfect weapon for deterrence. He did this in the belief that this would actually be used only for the form of deterrence. During the events of Metal Gear Solid: Peace Walker Huey then learns the true intentions of Hot Coldman. Then he met for the first time on Big Boss and joined the MSF to stop Coldman. In the Department of Research and Development of MSF itself Huey Emmerich devoted to the development of Metal Gear ZEKE and the fight against Peace Walker. 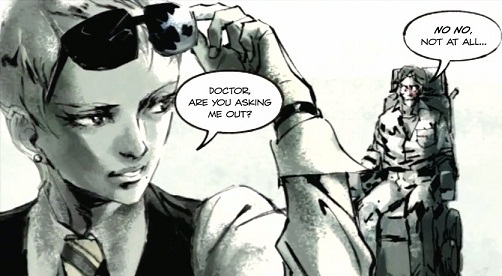 During the event ZEKE was stolen by Paz Ortega, who turned out to be an agent of Cipher and began ZEKE against MSF. Once again a creation of Emmerich has been used in a way that he had not foreseen. After the "Peace Walker" prolapse, he even came to meet Dr. Strangelove who asked him that he should contact, if he applies the necessary self-confidence. During the events of Ground Zeroes Emmerich gave Skullface and XOF grouping unconsciously access to Mother Base, considering that they were mistaken for inspectors of the International Atomic Energy Agency. Thus he is indirectly complicit in the destruction of MSF. In 1980 Emmerich became a father and had a son, whom he named Hal. In Metal Gear Solid 5: The Phantom Pain, Emmerich has managed to develop a mechanical exoskeleton for himself, which allows him to walk again. In previous appearance you saw him also in an interrogation with Ocelot, presumably due to his indirect complicity in the destruction of Mother Base. As his story really goes on, we see more of him when the MGS 5: The Phantom Pain release on PC, Xbox 360 Xbox One, PlayStation 3 and PlayStation 4 on September 01.